With all of the different styles of metal to choose from, it feels like I am a kid in a candy store, as everything gets me so damned excited, and I want it all!! The biggest thrill though, is the classic simplistic style that formed the whole damned thing... Old School Metal. Some bands that are out there today are reviving the old styled sound and then set to work making it relevant in todays metal market. Hailing from the lonestar state of Texas, Cruxiter stands loud and proud in the sea of metal. Coming at you with a Hard Rock/Heavy Metal style that perfectly blends the traditional rocking style of all of the NWOBHM powerhouses while adding in some explosiveness like the mighty romping of Pantera with wee touches of heavier edges Prog Rock like 70's powerhouse Styx. You end up getting a band that thoroughly rocks as hard as anyone - yet can still hold there own in the musicianship category. With only two songs submitted, it is hard to make a good review that will be all encompassing and hearing some other songs that are not a part of the Demo submitted is not a fair thing to do (I did their "From Her Eyes" earlier - 8.5)... I will just say that both songs that are on here are perfectly sculpted to be classics. One is the song that I have heard, as still blows me away('Paradise Found') and the newer song called 'The Church/May Eve' explodes out and grabs me. 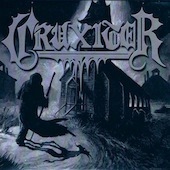 Cruxiter has impressed me, even though usually giving me only one new song would be reason to give a horrible review - the lone new track does have something worthwhile to get excited about. They may not be reinventing the wheel, but there old school metal will entertain and inspire other metallers. Great music is hard to ignore.